Mzetamze means "sun of suns". A mythological name, indicating female origins: "The sun laid down and bore the moon", it says in No. 32 (see also the Sun-Wheel in the middle of the pillar in the adjacent drawing by Nino Brailashvili. This so-called deda bodzi, Mother-Pillar, supports the domed, wooden roof-construction of traditional peasants' houses in Kartli). Here, the sun symbolizes both the inherent self-confidence of Georgian women and a new approach to their traditional music. In 1986, 6 women musicologists from the Tbilissi Conservatory joined together to form an ensemble dedicated exclusively to the musical traditions of Georgian women, known until then to only a small circle of specialists. The initiative came from Edisher Garaqanidze, who earlier had started work based exclusively on field recordings with his ensemble, Mtiebi. Since 1988 Mzetamze receives support from the Center for Folk Art and Culture (Director: Ts. Kochechashvili). Research, performance and pedagogical work with children and adolescents are tightly-woven components in the Ensemble's activities. Artistically, Mzetamze tries to be as true as possible to original source material, and strives to preserve local peculiarities of intonation and vocal style. To this end, the group consults recordings, either collected in the field themselves, or from the abundant archives of the Tbilissi Conservatory. The ethnological context from which the songs originate, with their rituals and actions, are integrated by the Ensemble into their presentations this includes, for example, performance of the dances which belong to some of the songs. At home, Mzetamze has received many distinctions for its work. The Ensemble gives concerts, has made TV and radio recordings, has appeared in documentary and feature films and taken part in festivals, conferences and symposiums: '88 in Moscow (First International Folklore Festival), '90 in Vilnius (Folklore Spring), '91 in Riga (Festival "Baltica 91"), and in Berlin (Festival of Caucasian Culture, this last together with the ensembles Mtiebi and Soinari). On the resulting CD from Berlin, Mzetamze is predominantly represented by examples of urbane folklore: Soinari, Folk Music from Georgia today, 1993, SM 1510-2. Men and women in traditional Georgian society reign over separate domains, a fact which is also mirrored in their songs: those with representative functions, such as table songs, are sung exclusively by men, whereas women's songs are tied, rather, to rituals and customs, to important moments determined by agricultural cycles and those of birth and death. Often the words and music of a song are supplemented by movement, not only in actual dance and circle dance songs, but also in dirges or ritual songs to heal illnesses or to influence the weather. These songs throw a new light on the confusing, many-faceted map of musical dialects in Georgia. Otherwise neglected regions, where part-singing is less developed, exhibit their own distinctive profile. Solo songs retain their importance. Surprisingly, the melodies display similarities, despite stylistic variations and inter-regional distances. However, complicated three-part singing does also exist among Georgia's women. Performers for the following songs are listed in sequential order of appearance: the first then, is the damts'qebi, or lead singer, who actually sings the second-highest line. In the antiphonal songs, the alternating groups will be listed as I and II. Bani is the collectively sung bass line, whose performers will not be listed individually. Cradle songs are of special importance for cultures which pass on their musical heritage orally: "The sharing of one's national musical language and the building of a particular approach to musical thinking and understanding, begins in the cradle; melodies heard in childhood and embedded in one's memory are for a lifetime", wrote Nino Makharadze in the preface to her soon-to-be-published collection of Georgian cradle songs. Also included in this collection are instrumentally accompanied songs and songs for part-singing. Mzetamze's selection is restricted to songs having the oldest and simplest form. They illustrate an amazing variety, from the additive expansion of a succession of notes in phrase-length and duration (No.2) to the many-sectioned melody of a stanza song (No.27). Two songs are based on the same melodic model, although they originate in regions far removed from one another: No.12 is from the Black Sea Coast, No.18 from Khevi, located on the north flank of the Caucasus Mountains, at the foot of the Kasbeg (5047 m). Between the lines without any determinable meaning are the following irregularly dispersed lines: "Nana, my child, nanaila, / nana, I tell you, nanaila, / grow up, become clever and brave, / grow up with a good spirit, / and sleep in good humor, / you, good child, whom we will raise, / the mother willing to take your place [in calamity] / age in peace and contentment." "Haa, nani, nani, nani, / your mother will take care of you. / I cradle you and will do everything for you. / Haa, nani, nani, nani, / your mother will look after you, / t'it'i-t'it'i (child's talk) goes the cradle, / grow, you my ch'it'a-p'it'i (p'it'i: child's talk: little lamb). / Haa, nani, nani, nani, / your mother will look after you." "When I tell you nana, be pleased to hear it, / your eyes will fill themselves with sleep, / nanebi, nanebi, nanebi. / Beautiful eyes have you. / You will sweep back your head of hair, / the girls will run after you. / Nanebi, nanebi, nanebi. / You, my dear one." Cradle songs are not only for putting children to sleep. The moment of falling asleep is purported to be fraught with danger, and the child especially susceptible to the spells of evil spirits. Thus, cradle songs also contain traces of ritual: ghughuni (cooing, No.23) or ghighini (quiet singing to ones self, in an especially low vocal range, No.31). Included in this context may also be the use of the word nana, the Georgian designation for cradle songs. Often, interrupted occasionally by pet names, it constitutes the entire text (Nos. 2,18, 23). As one of the most common and numerous "nonsense words", it also appears in songs of a completely different nature (No. 3). In addition it means "mother" in Megrelian and Lazian (No.12) and is from time immemorial one of the most common woman's names in Georgia. Georgian ethnologists relate it to the old oriental deity of light and fertility, the Great Mother. The bat'onebi (lords*) are spirits who live beyond the Black Sea. They allow parts of their realm to appear in the most diverse corners of the world. They obey an "Highest" Lord, who, to test the loyalty of mankind, sends bat'onebi out in all directions. Dissidents are to be killed or enslaved. During the day, the bat'onebi move about on mules, in the evening, however, they return to the houses of the sick and reside in the bodies of the stricken. Bat'onebi are to be obeyed without question, as resistance only enrages them. Nonetheless, their hearts can be won over with tenderness and caresses; thus it is possible to protect ones self from calamity. Bat'onebi enjoy gentle songs and the bright sound of instrumental music. Such concepts are the basis for the rituals which are performed at the bedsides of infectiously ill children. The pox (see No.5: skani kuchuchi, your buds) from chicken pox (qvavili, literally: flowers) and the redness from measles (ts'itela, literally: redness) are signs of the arrival of the bat'onebi. The patient, his bed and his room are decorated with colorful fabric and flowers. His visitors wear red or white garments and walk around him with presents for the bat'onebi in their hands. A table full of sweets, and a kind of Christmas tree, is prepared for them. Singing and instrumental music are essential for making contact with the bat'onebi, praising and favoring them, and "receiving" the pox. If the illness becomes worse, one turns to the ritual of "asking-for-pardon" (sabodisho), where a mebodishe, a woman who has access to the bat'onebi, is invited to contact them and ask their wishes and win over their hearts. Upon becoming well, the bat'onebi are to be escorted on their way again. The ethnologist Vera Bardavelidze (The Oldest Religious Concepts and Ritual Graphic Art of Georgian Tribes, Tbilissi, 1957) sees in these lords and their ruling lady, the "Great Mother" Nana and her children (see text No.9). Although she is never actually called Nana, the name, except in the Megrelian version, is present in all of the following songs. These are similar not only in textual material; most of them also utilize a similar melodic formula, elements of which are also to be found in other types of songs: in the cradle song from Pshavi (No.27), in the circle dance song celebrating the birth of a son (No.32), or in Gonja (No.1) and Elia (No.35), which entreat a change in weather conditions. "O violet, nana, o lords, o roses, lords, / amuse yourselves, calm yourselves, o roses, o lords." "Naninana, o lords, / naninana, o lords, nana, / amuse yourselves, sweetly, o lord. // By the mother of these lords, / naninana, great lord, / there stands a golden cradle, / naninana, great lord. // Within lies the lord's child, / naninana, great lord, / from time to time one rocks it, / naninana, great lord, / from time to time one tells him nana, / naninana, great lord, / naninana, o lords, / naninana, enjoy yourselves, lord." (Nana Valishvili), recorded in 1960 at Gorisdzikhe-Pkhelshe (district of Qazbegi) by Mindia Jordania. O violet, nane, o rose, nane, o violet, nanine, / the violet scatters roses, o violet, nanine". "Violets, o lords, / violets are scattered for you and roses, / violets are scattered for you and roses, / my couch and your buds, / mother, heal your sick ones." During drought or continuous rain, rituals are performed, which strive to change the weather. All three of the recorded examples presented here originate from the East Georgian region of K'akheti, but similar ones from other regions have also been handed-down (sometimes under the name of another saint, like Lazare in Kartli). - 1. Gonja, K'akheti, recorded in 1955 at the district of Qvareli by Grigol Chkhik'vadze, (I: Nat'o Zumbadze, Ketevan Baiashvili; II: Nino Shvelidze; bani*). Every line of the text is repeated by the second group. The first group sings it in three-part harmony, the second group in two-part harmony. "The gonjaoba wanders around, gonja enters under the door, / walks here, walks there to the shelf, resembling the moon, / ah, Barbare-Barbare, chase the clouds from the sky, / sieve appears to remain sieve, good weather is already hurrying on by, / the gonjaoba wanders around, gonja enters under the door." Gonja (from gonji, ugly) refers to a man-sized doll made of cross-wise bound sticks, which is hung with rags, sometimes smeared with mud and carried from courtyard to courtyard by women during the ritual. If the wish is for clear weather (No.1), the onlookers try to scatter ashes onto the doll and its carriers, if the need is for rain, the women sing a slightly different text (No.35) and are sprayed with water. Each household knows that the success of the ritual depends on everyone's participation, and a donation from one's provisions to the processional group is expected. If one proves himself to be miserly, the doll is lowered to the ground, which is a bad sign for his future harvest. The procession ends with a feast, where the donations are shared by all. "Praise and thanks to God, praise God, / this Elia, Elia, / came down from heaven. // Praise and thanks to God, praise God, / sieve appears to remain sieve, / rain is already hurrying on by. // Praise and thanks to God, praise God, / we don't need more dry earth, / God, give us mud, / you, our glorious God. // Praise and thanks to God, praise God." Here, instead of St. Barbara (see also No.37), Elia is called upon, the Prophet from the Old Testament, who predicted drought and rain for the people of Israel. He is looked upon in many parts of Georgia as the weather maker. His name sounds similar to the Georgian word for lightning, elva, which fits ideally with the image of his biblical passage to Heaven in a fiery chariot. The sieve (tskhavi) in the strange chant tskhavi atskhavebula, "sieve remains sieve", is a large tool used for corns of grain. It may stand for all household tools, which will lose their function in the impending poor harvest. The ritual, "Wailing over the Plow", is known only in K'akheti. Dat'ireba means "wailing for one passed away". As in the dirges (which in K'akheti can be two-part songs), the text is a recitative sung over a two-tone drone. It has neither rhyme nor meter and has no coded formulas. As in the gonjaoba, women collect donations in the village. Afterwards they go to the river, where they splash each other. They put the plow in the water and harness themselves in front, as if they were oxen desiring to plow the water. As in all weather rituals, "Wailing over the Plow" is an affair for women: men are only allowed to take part in the final feasting. "I: Come together, ye women, / let us plead our case to God, / otherwise we will be scorched and burned, / perchance He will grant us a bit of dew. II: We will go, Nanaila, will go, women, to ask God, perhaps he will hear us. / Honorable God, we beg you, we plead with you, consider us worthy of dew. I: Care for this [world in] Sin and Grace, destroy not our crops, / find us worthy of a bit of rain, turn us not away from your Grace (literally: Communion). II: Honorable God, whom we always remember to call on, we ask you, plead with you; / we are your children; as you bore us, let us remain. I: We hope, God, that you will take care of our [world in] Sin and Grace, find us worthy of a little dew, let us not burn, / the whole world stands aflame, alas, look down upon us, at our predicament, / God, dear God. II: Fear not, God will not withdraw His hand from us. / There has been worse than this, and we still live." The work songs of Georgian women are more unassuming than those of its men, collective work being rarer among the women. Often, women will gather together even if the work to be done does not demand this. In such cases, singing serves to entertain, as in the following song of the spinners, which, according to fancy, weaves word and rhyme with motives from love songs. "Oy, nani da nana, the spindle has rubbed sore my hand, / the spindle, would that it break. / He promised me, he deceived me, / he, would he break his neck. / On the flax comb there remains yarn, / for you I still have respect. / To the well I drove the oxen, / the red ones, the horned ones. / The girl with whom I have a date, / has hair down to her ankles. / The spindle has rubbed sore my hand, / the spindle, would that it break." The cow is addressed as dedo, which perhaps not coincidentally, sounds like deda, mother. Pet names (chemo shveliav: my deer; she samglev: you wolf's meal) serve to calm them. "Dedo,... my little one, / stand! what are you beating with this tail here, you wolf's meal, you, and don't tip over the milk! / Dedo,... let the milk flow, don't hold it back, / dedo,... stay, cow, stay, / dedo,... stand, stand, stand, / dedo,... ho, little one, stand, little one, stand." (Ketevan Baiashvili), recorded in 1987 at Lisho (district of Tianeti), by Ketevan Baiashvili, is sung to accompany different kinds of work, very quietly and by all means, alone. The descending melody, reaching the tonic only at the end of the phrase, exhibits a close relationship to the dirges (also the improvised text), although of private character: it is to the memory of an adolescent lover, who died in an avalanche. My unfortunate one, I lament your destiny, / you, who darkened my sun, / who dried out my well, / who filled my eyes, / you, who turned my day into night, / who silenced my voice, / who dried out my heart, / you, for whom I go in black, / who made me forget joy, / who dried up my tears, / if you would come with the light of the stars, / and visit me from time to time, / you, for whom I long even in my dreams. / Despondent am I without you, / I know not even where I should search for you." "The Korkali from Rach'a are associated with a very specific type of work, the grain harvest. In these mountain regions the fields are often so small, that it makes no sense to work in groups. While the melody and designation (korkali means whining) point definitely to the dirge, the thematic material of the texts belong to the genre of harvest songs, where love and the anticipation of meals brought to the fields, for example, are often sung of. A similar connection exists in the high mountain regions of East Georgia, where the men sing Gvrini (in mourning fashion) while harvesting hay. This juxtaposition of dirge and harvest song is no coincidence: according to surviving beliefs, especially in the high mountain regions, the dead have an important influence on the living. They can also have an impact on the productivity of the fields: in Tusheti, for example, corns of grain are strewn on graves on commemoration day, while one prays for a good harvest. "Beyond the waters stand cherry trees, / around them women rally. / With one glance we know / which of them is aware of us. / Beyond the water a beautiful woman / began to wave to us with her veil. / Here, desire flamed up in us, / there, she beckoned so." "Cuckoo, what are you saying about us, / who have had no breakfast and no lunch, / call to us, cuckoo, / when the field is attended to. / From the black rock a black raven, / takes off and plunges downward, / downward, to gorge upon a carrion, / he will be too lazy to fly up here." Weddings and funeral services still belong today to the most costly events in the life of a Georgian family. They can easily lead to the brink of financial ruin. Joy as well as sorrow are heightened in a community setting; they are also easier to bear. Reflecting the patriarchal order (the bride leaves her family and becomes a member of the groom's), men's songs dominate the wedding. For the funerals, women play the main role. The bereaved family announces the death of one of its members by loud cries and wails, neighbors and relatives come running. The deceased lies laid out, five to seven days in the house, so that all can pay him their due respects. Young people watch over the coffin during the night. Up to and including the burial day, his death will be lamented from morning until evening. Not only family members lament his passing, there also exist professional mourners of the mostly improvised t'irili (literally: crying), the so-called mot'irali (lamenting women). One of these was Eliso Lomashvili, recorded during a funeral service. She was invited to funerals solely on the basis of her outstanding ability; if she came of her own accord, this was a great honor for the deceased and his family. Her dirge is distinguished, aside from its vivid pictorial language, by its nine-syllabic meter, which in the orally transmitted poetic tradition, is very rarely heard." "Sun, how can you still shine, / day, how dare you laugh. / The heavens and clouds astound me, / that they haven't yet begun to weep. / Have I the strength to speak / on the dignity of such a young man. / For yourself alone, you did not die, / you died for our village and for our people. / If only I had the power / to fill the grave with tears. / Rise up and return to your family! / How you have made your mother bitter. / God will recognize our tears as justified. / Black [clothed ones] follow behind you like shadows. / spoken: How you have made us bitter with your death." The t'irili, performed immediately before and during the funeral, are not solos. Every phrase must be substantiated by the mokvitine, who sit around the deceased, with actual sobbing (kvitinit t'irili: lament with sobbing) or with singing (khmit t'irili: lament with voice). Together with the expressive gestures and rhythmical movements with which the mot'irali accompany their presentations, this results in a dramaturgical whole. Its expressivity is not simply for comforting the bereaved. According to traditional belief, they ease the passage of the deceased to the other world, "they soften for him the earth." "Hurry, soon it will be night for you, / you of great works and great charity. / Don't be afraid, it is the black land [of the dead]. / Don't furrow that smooth forehead with wrinkles, / and no tears should fall from those beautiful eyes, / it is the black land [of the dead], don't be afraid. / Ach, you miserable spring, / greening mountains and valleys and their peoples, / May has become warm, / all living beings will appear, you Miserable One, / they will find your beautiful right eye, / you Miserable One, don't be afraid, / don't believe it is the hand of your mother, / those beautiful eyes and broad shoulders will disintegrate. / Ach, would that your mother could be in your place. / Does it not concern you at all, how fares your mother since you left? / Soil will be scattered on your breast for you. / Go, stride through the Gate in peace. / You will be afraid, my Beloved." Here the form of dialog is raised to simultaneousness. The first singer, the mot'irali, speaks directly to the deceased Irakli, when she laments his untimely death, and praises his services to family and government, and to his children. The second, however, who assumes the role of the mokvitine, addresses herself to the first. Kalo (woman), she is called, as soon as she graduates from sobbing to speech. Similar to the chorus in the ancient tragedies, she gives voice to the thoughts of the spectators. When she also begins to sing, the existing interplay of dialog gradually metamorphoses to become an interweaving of musical lines. Although the autonomy of the voices is preserved, both utilize segments from the same, or closely related, scales, which are only differentiated in the upper range. I: (...) Now, you know, you must bless your children. Your children will give your enemies no joy. .
Irakli, Irakli, Irakli, you our good neighbor, you know, you must bless your neighbors, and all who have come and honored you, bless all and your children, go now, go. II: (...) All, all of us who are also as if buried, he should bless, kalo. What can help him, the Pitiful One, if his right hand fails him? He is to be pitied, that he cannot come or go anymore in this life, kalo. I: (...) Your heart should not grieve after this life here, we are all temporal and will all go your way, woe, woe, woe, woe, woe. II: (...) Under this miserable Earth are we all, no one can escape, kalo, it is full up to its neck, and there in the otherworldly, it is also so for those poor souls, kalo. In the mountain area of Rach'a, three-part funeral songs have survived, which are performed at especially festive burial services. The designation Zruni, is defined by the Georgian encyclopedist Sulkhan Saba Orbeliani (1658-1725), as "accompanies a mourning song", indicating that it serves as a background for the dirges. An example is the polyphonic, text less Zari (dreadful; wailing; knelling) of the men which, once common in all of West Georgia, is now only heard in Svaneti. Texts exist for the Zruni of the women of Rach'a, but these do not refer to the concrete funeral situation. Our text here commemorates the burial of King Vakhtang Gorgasali (446-502). Barbale must refer to St. Barbara (see No.1), and not the person being carried to the grave. "When Vakhtang, o Barbale, ole, the King died, / oi da, the heavens shrouded themselves in grey. / Nobles, o Barbale, da ole, and peasants, / oi da, prepared themselves to mourn him. / The heavens, Barbale, ole, collected clouds, / oi da, and thunder roared above those on their way. / Your poor, Barbale, da ole, parents, / oi da, could not see your crown." The mourning rituals are by no means concluded with the completion of the burial. Even today, bereaved families will not make music for a whole year. In Tbilissi, where dirges are no longer common, this practice is still widely observed. The deceased is mourned further on specific days at the cemetery, at home at his bedside or over his laid-out clothes, and during work (No.10). These commemorative dirges are solo songs, as the refrain-like sobbing or vocal injections of a group present at the initial funeral service are absent. "Brother, your sister will die, your sister is near the end, / Brother who perished, who died from working so much, / Brother who vanished thither, Brother who perished, / both dead and alive a guest in your native country, / who drifts as the wind over native ground, / Brother, brother who perished, your sister is dying, / your sister is near the end, Brother, your calamity on me." "My sister, why did you destroy my world so soon, my sister? / My sister, why did you leave this world so soon, my sister? / My sister, what do I have to live for after you, my sister? Why did you leave me behind in this deceitful world, my sister? / My sister, what have I to do in this deceitful world after you, my sister?" Elements of dirges are also to be found beyond mourning rituals (Korkali, Nos. 21, 29). In Tusheti, Georgia's most eastern high-mountain region, they appear in songs totally divested of their original function. These are accompanied by the there-especially-popular accordion (garmoni), introduced from Russia in the 19th century, or appear in three-part form. "My daughter-in-law, my graceful and clever one, / who never raised her voice so as to irritate the village neighbors, / from whom guests always departed well-fed and housed. // Now you need tears, as many as there are rain-drops in the sky, / wailing women you need, as many as there are stars, / I would like to take your place, my daughter-in-law, my dear one. // I will not be able to see anymore, how you walk through the door, / nor even the bed, on which my daughter-in-law once lay, / I would like to take your place, from fate Cursed One. // Water so still as if seeped from a pool, / o, morning dew, which never harms men, / your mother would like to take your place, my daughter-in-law, my dear one." "Mother would like to die for you, my child, / she is destroyed, your own mother. // My child, where did you go with pack and shepherd's coat, / where did you leave the shepherd's staff, which was at your side? // My child, I will throw / the black bridle over your horse, let it out into forest and field. // Mother would like to die for you, my child, / she is destroyed, your own mother." The shairoba, a competition in extemporized verse, is a special entertainment, where girls and boys also occasionally take part. New verses are constantly improvised to more-or-less set musical forms. In the following shairebi, only the music and the refrain correspond to field recordings. The text offers a playful self-portrait of Mzetamze and its untiring collectors' activity. Refrain: Heri, lad, herio, I sing even for that / if we enjoy ourselves so much, what can the enemy hurt us, / heri, lad, herio, I sing even for that." During such evening amusements one thing easily evolves into another. With the words t'ashi, t'ashi, those standing are animated to clap with the hand, and suddenly someone has stepped into the circle and begun to dance. The lute Panduri accompanies songs and dances in all of East Georgia. The body and neck of the instrument is made of a single piece of wood, the back often decorated with carvings. The finger board is outfitted with diatonic frets. The three strings, traditionally of gut, are tuned in seconds and fourths to the bass string. This string, the top string in playing position, is pressed down with the thumb, and thus produces the two-tone drone, which is so often found in the songs of East Georgia. The following dance song (also Nos.16 and 25) is based on a recording by the American music ethnologist Peter Gold, which dates from 1968 in West Anatolia (Georgian Folk Music from Turkey, Ethnosound Records EST 8002, 1972). Before the Russian-Turkish War of 1877/8, a large part of the population of Shavsheti and other southern Georgian regions were relocated to the district of Bursa. These South Georgians had fallen under Osmanian rule at the beginning of the 17th century and were converted to Islam, but they preserved their language and knowledge of their Georgian heritage. In 1918 the independent Georgian Republic had to cede Shavsheti again to Turkey, while Atch'ara, on the northern border, could remain Georgian. "The brook brought a piece of wood, / cut off from the poplar tree. / Stand still, brook, and tell me, / what message Ali has sent me. // On the other bank, doves. / Maiden, why do you shy away from me? / As you are so beautiful, / you are for me grown up." Similar texts are well-known in many parts of East Georgia, but they mostly contain a different ending: the river tells of the violent death of the distant beloved. Another dance song recorded by Peter Gold has been identified by Mzetamze as a wedding song and further supplemented by them, based on a version from Atch'ara, of which only the text was known. Because of the question-and-answer nature of the text, the song is presented antiphon ally. "Voy, these beautiful slippers, / who gave them to you, voy? // My dear, my sweetheart, / he gave them to me, voy." This song is sung while dressing the bride. In the following six stanzas only the articles are varied: necklace, scarf, silk for a dress, earrings, ring. The musical form of the antiphonal song is very often connected with its performance as circle dance (perkhuli). 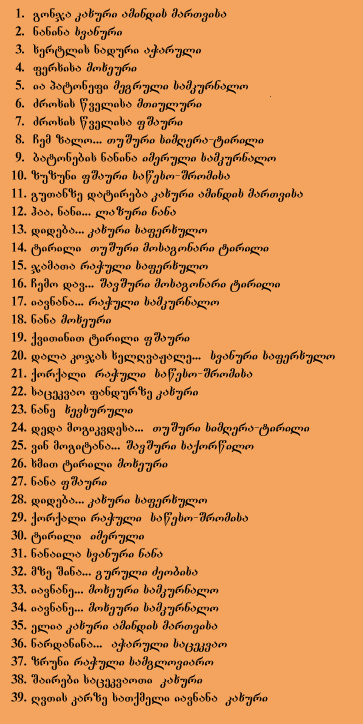 Ring dance songs (saperkhulo) constitute one of the most important forms in the traditional music of Georgia. With its organic fusing of word, song and dance, it is also one of the oldest. As opposed to dances, where the performers are allowed individual artistic freedom, circle dances are stricter in form, require sparser movements and subordination to the group. Most of them have a more-or-less obvious traditional or ritualistic background. (Nat'o Zumbadze, Nino Shvelidze; bani). This is the only recording on this CD which is not based on a live recording. The first to do research on traditional Georgian music, Dimitri Araqishvili, wrote down an instrumentally accompanied version shortly after 1900. From this, Grigol Chkh'ik'vadze reconstructed a purely vocal one. Collectors who kept only the text and a few literary documentations dating back to the 18th century, attest that it has been executed after sundown following the birth of a son. It's puzzling text has been connected by Georgian ethnologists with astral cults, which have been written about in old chronicles. Sun within, sun without, sun please come in. / To us is born a son, sun please come in. / The baby's father is not at home, sun please come in, / is in the city looking for a cradle, sun please come in. / The sun laid down and bore the moon, sun please come in." "The following two three-part ring dances from West Georgian mountain areas belong to the rather rare examples, which can be performed by both men and women. "Dali gave birth on a cliff, / gave birth on a white cliff, / gave birth during the day and into the night. / Below a wolf waits, / overhead ravens circle." Dali, a holy being of bewitching beauty in Svanetian mythology, is protectress of game in a wilderness untouched by man. She has an ambivalent relationship with hunters. If she takes one as her lover, she becomes severely jealous and forbids him any contact with mortal women. The newborn child falls from the cliff and is rescued from the claws of the wolf by a hunter. Of the three rewards which Dali offers him, he chooses the successful yearly shooting of nine ibex. However, he doesn't fare well: one of the ibex has golden horns and of course, the hunter takes aim at him first. The bullet rebounds and strikes the hunter himself. He had forgotten, that the golden horns indicate Dali has taken this animal form. In this song, the alternation from one group to the other is concealed in a special way: the second group repeats the closing motive of the first group a tone higher (on the meaningless words, ole, lile). The text tells of the inglorious end of the Svanian robber Jamata, who, with his band, raided and plundered the village Ghebi (located west of Svaneti, in mountainous Rach'a). With the extremely harsh survival conditions indigenous to such high mountain areas, bloody feuds and robberies were quite common. "Ole, lile, o, poor Jamata, ole, lile, o, / ole, lile, o, Ghebi follows you and your band, ole, lile, o, / ole, lile, o, the weapon struck you in the back, ole, lile, o, / ole, lile, o, blood runs from you in streams, ole, lile, o." In the high mountain regions of Georgia, religious concepts and practices influenced (and often still influence) the course of events during the year and the social life of its people. The canons of the Georgian Orthodox Church were often observed in name only: pagan concepts certainly lived on in these hardly accessible regions, or sprung up again in times when the crown was weak. At religious celebrations almost all of the activity is reserved for men. Women were to keep their distance from central rites and holy places. In Khevi there exists an exception. "Hai, Praise the Enlightener, / praise K'vire, the Child of God, / praise and praise all the saints. / Bless us with your Grace. / We have come to your field / with candles and ritual cakes. / Praise the Enlightener, / hai, hai, great praise." The Enlightener, natlismtsemeli, is John the Baptist. The Georgian word for baptize, natlis tsema, means literally "enlighten". In Khevi, he is specifically honored as "Patron of Children", especially of their eyesight. K'vire, K'viria, or according to the church calendar, K'virik'e (St. Cyriacus) comes before St. George in the hierarchy of the East Georgian mountaineers. He is the messenger between God and the other "Children of God", meaning the saints, who like himself, are protectors of a clan. In the valley regions of Georgia, Christian holidays have also retained their meaning, despite 70 years of atheist propaganda. One meets at the often remotely-located churches, even though no masses have been read there for a long time. Each has food and drink, so that it is possible to pass the night awake, in the churchyard. Circle dances, as the men in the East Georgian mountains sing and dance them for their saints, are performed here by women. Mzetamze has recorded two variants of such a ring dance in honor of St. George. In the two-part one, the end of the first half-stanza, where the ascendance of the drone is completed, is intersected by the entrance of the second, so that it is, in a way, cut off in mid-sentence. The second variant adds, in parallel thirds, an upper voice to the first group and a lower voice to the second, so that the two half-stanzas are hardly to be differentiated. This time each group ends its own part, resulting in an irregular meter of five units. "Praise, God be praised! / We have to name God first, / He is the most glorious, / then come all the saints. / St. George sits on a horse, / sits on a thoroughbred, / in his hand the whip, / the whip and other weapons. / St. George alta (? ), / I wander from mountain to mountain, / give us God's Grace, / fill our laps with bread, / fill our cellars with wine. / Praise and thanks to the Father, / praise to the low Mother, / praise, let us praise to God." "Praise, God be praised! / We have to name God first, / then all the saints. / St. George and yalta (?) / wander from mountain to mountain, / in his hand he holds the whip, / the whip and other weapons. / You our merry host, / the door to your wine cellar groans. / For us open the barrel that no one has opened. / Moisten our throats with new wine! / Are we then really beggars? / We are Christ's messengers. / Praise and thanks to God! / Nothing can amaze God. / Praise God, give us peace, / may Georgia achieve peace, / praise, God be praised!" This "beg-and-repent" song is not a ring dance song, but is heard during the same holidays as Dideba. In its characterization and refrain, it alludes to the bat'onebi songs (Nos.5,9,17,33,34). A parallel to the ritual of "asking-for-pardon" is actually recognizable in the refrain, iauda nana, and the words with which the singer begins eight of her stanzas: nanebit mogmartav, "in cradle songs (nana)", respectively, "in repentence (naneba) I appeal to you". They close, however, with the well-known benediction formula, mraval-zhamier, long years, which comes from the text to Mass. The three hundred and sixty-three Giorgi's should live, / all the Light he ties behind him as if on a [gleaming] sword. / Praise to the Power [of God], peace to our Georgia, / iauda, ho, ho, ho, ho, hai da da, long years!"